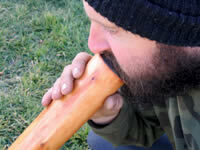 "Echo Tree Didgeridoo Mouthpiece Kits"
change and create your own high quality didgeridoo mouthpiece. This can be done with relative ease in a warm environment by simply squeezing it in the hands until pliable, but can take a little more effort under cooler conditions. Note: If the beeswax does melt, it is not ruined; it just makes it more inconvenient to get the job done! Place the beeswax out of the wind and in direct sunlight; like on a window sill. 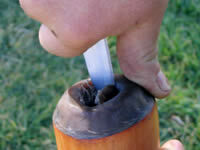 Close supervision is essential as the beeswax can melt if left too long. 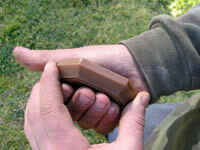 When the beeswax has become about as soft as plasticine, it is ready to be shaped. 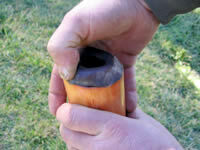 On the low setting and holding the hair dryer at half to one arm's length from the beeswax, heat as you rotate the ingot. You must be very careful not to melt the surface of the ingot-this is why it is best heated at a reasonable distance and constantly moved about. 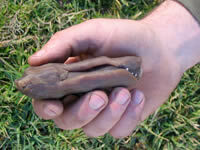 When the beeswax has become about as soft as plasticine, it is ready to be shaped. 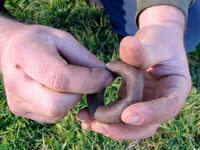 Do this by squeezing the soft ingot in your hands. If beeswax cools, simply reheat it again. 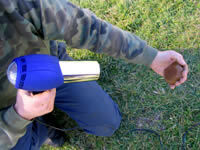 It is important to keep the beeswax at a workable temperature, so keep your eye on this. 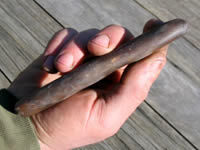 Find a flat surface and roll beeswax into a sausage that is about 15mm (just over ½ an inch) thick. Ensure that the sausage is of even thickness throughout the length. 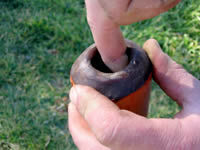 Ensuring that the beeswax is still nice and soft, bend sausage into a circular shape and join the two ends so the inside diameter is about 35mm (about 1 ½ inches). 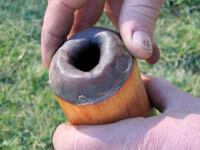 This will produce a mouthpiece with a diameter of around 30mm (1 ¼ inches) when the job is complete. If you like your mouthpiece diameter to be larger or smaller than 30mm, simply add about 5mm (1/4 inch) to the final internal diameter you require. 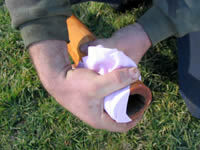 Save any excess beeswax as you will need some later for this project. 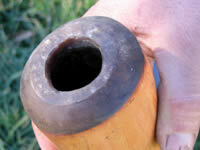 Keep in mind too that the extra you have left over after creating your mouthpiece can be used to seal up any air leaks you may find in your didj-now or in the future. Using an appropriate cleaning agent and a clean, oil free cloth, ensure all dirt and grease is removed from the top end and inside/outside of the didj down about 25mm (1 inch). 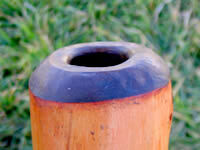 Take a small piece of the beeswax you have left over and making sure it is nice and soft, smear it onto the end of the top of your didj. 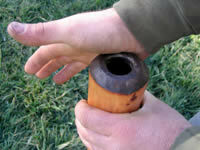 The aim here is to lay down a thin, well adhered layer of beeswax to the timber. 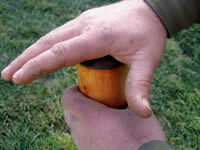 This is achieved by using firm downward pressure to push the beeswax in front of the thumb, thereby smearing or 'keying' it onto the timber surface. 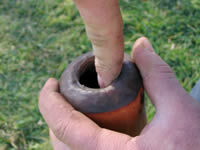 The harder the beeswax is when you are doing this, the harder it will be on your thumb! So keep the beeswax nice and warm. 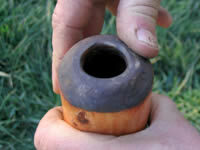 Make sure both the keyed beeswax on the didj end and the donut are warm-reheat them if necessary, but be careful not to allow any surface melting to occur. 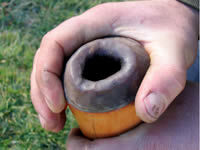 Place donut onto the keyed didj end and while pushing down firmly with the palm of your hand, very slightly twist your hand back and forward to settle and seat the donut. 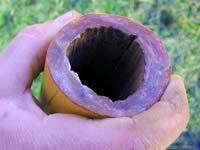 Do not twist too much-the donut itself must not physically twist against the didj end or break contact with the surface you are mating it to. A gentle but firm 'wriggle' is all that is needed here. Step 9 And Now Just Making Sure! 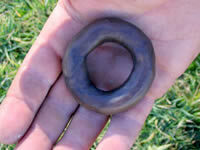 Pushing straight down fairly hard on the attached donut will ensure good contact. Just press down then rotate a bit and press down then rotate a bit etc., but always directly down. Keeping the beeswax warm still, shape it down to the didj's outside edge all the way around to form a gradual curve from didj to mouthpiece. Using the thumb seems to work pretty good here. 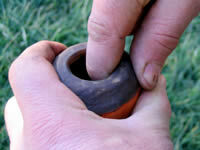 Using your hand as shown and with gentle pressure, do a final smooth over of the outside by twisting the hand and rotating the didj to cover the whole circle. 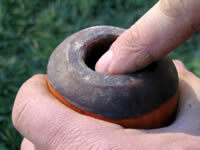 Using the middle finger or thumb and making sure that with the other hand you are firmly holding the donut against any pressure you create, push the beeswax on the inside down on a gradual angle till it meets with the internal didj wall. 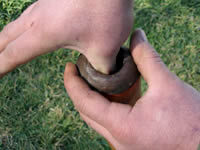 Go all the way around doing this and make sure you keep the donut secure with your other hand the whole time as the pressure you are producing may shift the donut if you are not firmly holding it. If this does happen, you will need to go back to the "'Keying' the Beeswax onto the Didj" step. Using an appropriately shaped, sharp knife carefully cut away any excess beeswax from the inside to get the desired internal diameter you want. 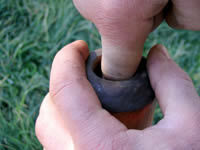 Smooth the inside with your thumb as shown using a twisting motion while also rotating the didj. 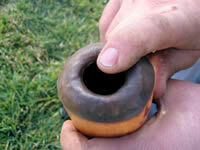 Make sure that you still continue to keep the joined donut secure with your other hand. 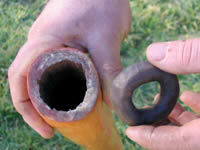 The lip is the very top part of the mouthpiece that will become the contact point with your lips. 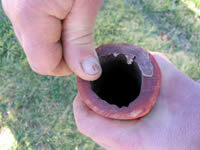 Work all the way around using your finger and sliding it back and forth over the lip and also down the inside. The aim is to finish up with an even surface that allows good flow into the didj. Remember to keep your beeswax warm! 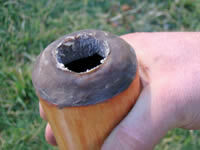 Do a final smooth around the lip using a straight finger as shown. 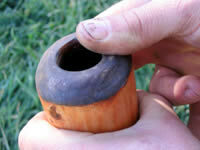 Do this by rotating the didj while twisting your finger so that you move around the inside circle of the lip. I.e. the motion here is circular, not back and forth. 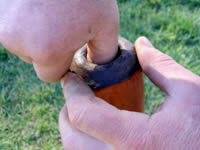 Give the mouthpiece a general smooth over by using the palm of your hand. The motion can be back and forth, twisting or however best suits you. 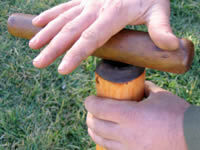 This can be done with downward pressure using the thumb or by gently rolling over it with some sort of 'rolling pin'. 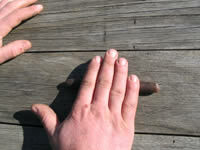 The rolling pin will produce the most defined and even result. Make this about 5mm to start with and if you find during playing that it is not exactly what you want, simply reshape it at the desired width. 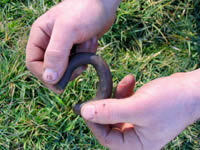 Simply run your finger around the inside at a 45 degree angle similar to the technique used in "Smooth Inside Lip". If you haven't already had a go, give your new mouthpiece a test play. See how it feels and if there is anything you think could be changed to improve it-both sound wise and comfort wise. 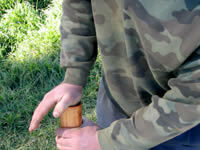 The oil from your skin that is left on the beeswax after playing will help you to do a final smooth over. Using your finger/thumb/palm and whatever techniques that may feel best for you, finish off the surface so it has no uneven spots. The next section called "Manipulation Techniques" will show you how to make further changes to the shape. 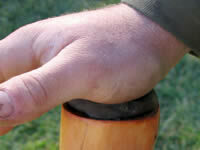 This can be achieved by pressing the beeswax down on an angle from the outside using the thumb. 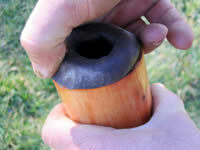 Close the diameter a bit at a time by rotating the didj and pressing the beeswax in until you have the desired size. 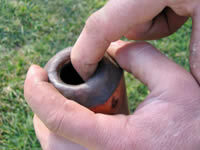 Try to keep the mouthpiece shape you want even by keeping your shaping even all the way around. Simply use your finger or thumb in a twisting motion to push out from the inside while rotating the didj to keep the enlargement even. Once again, it is wise to use your other hand to support the mouthpiece when you are placing it under upward or outward pressure. Continue a bit at a time until you are happy with the new size. 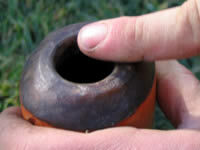 By 'pinching' the lip you can raise it up away from the didj. 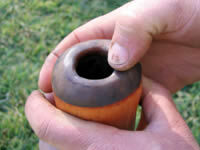 While supporting the mouthpiece firmly with one hand, pinch and gently pull up on the lip. You may need to re-flatten the lip after this procedure. It should turn out something like this! 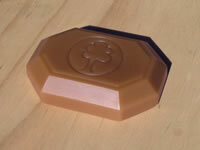 Although the colour of the beeswax may vary a little, the shape should be close to what's in the picture. Over time the beeswax will darken with use.